Join us with friends or family as you cruise the beautiful Noosa River. Dine on superb cuisine, cooked fresh aboard Noosa’s only cruising restaurant and bar and the “Number One” restaurant on the Sunshine Coast on . All our meals are freshly prepared and cooked on board. Join us for a full cooked breakfast and a welcome glass of bubbles (over 18s only). Individual seafood platters prepared and cooked fresh on board, or steak and salmon for those who don’t love seafood as much as we do! Two course lunches include delicious desserts. Enjoy a three-course a la carte meal, ordered and cooked fresh on board. Main course choices include steak, seafood, chicken and vegetarian options. Bubbles for breakfast? Coffee and cake? A lunchtime tipple? Sun-downer cocktails? You are welcome to join any of our river cruises for drinks and a sight-seeing tour. Relax on board enjoying cocktails and freshly prepared canapés, or an á la carte meal with fine wine, sumptuous buffets and fun beach BBQs or casual nibbles, or turn the music up, the lights down and party into the night! We can accommodate up to 48 passengers in casual luxury and style or seat 40 for a sit-down meal. Arrange an exclusive private charter for your next social or corporate event. 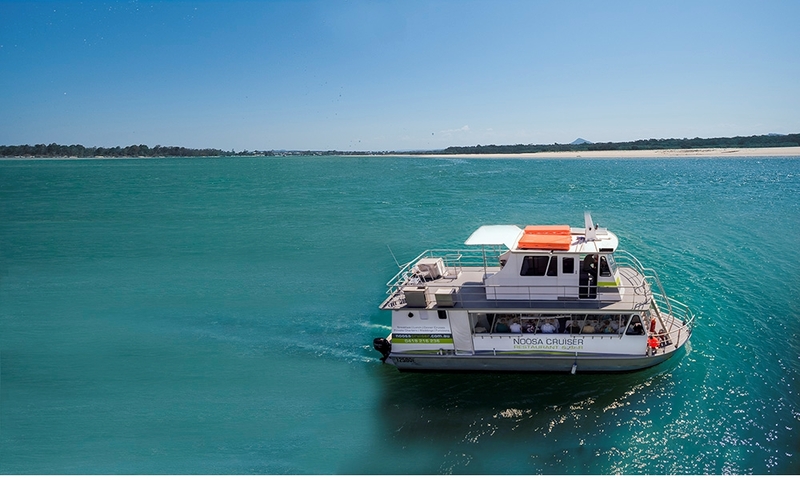 Charter the Noosa Cruiser as a restaurant, comfortable lounge bar or party themed venue…it’s more affordable than you may think. Contact us today for ideas, pricing and availability.